I don't like to get wet when I'm not supposed to be. I would make a good cat. 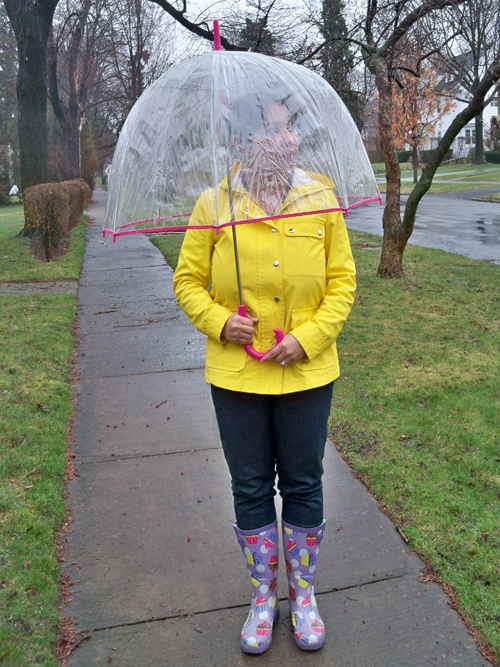 Expecting a rainy spring season, I was prepping my rain boots and rain coat. But I found my umbrella lacking. I found this one at Target for a very good price. And I love the design... it offers so much more protection, is more windproof and I can see where I'm going when I use it. Plus I love the name - bubble umbrella. Win, win, win. Hey thats different! I don't like to get wet either! Those were all the rage, when we were kids in the 70's. The only problem was when you sat with them, at a game or something, you always got a wet tush, because you couldn't angle it enough to keep the water from running off the right way. I was just saying I need to buy a better umbrella. I am in school and have to walk a ways from the parking lot. If it's raining either my lower legs get wet because of where I step forward from underneath the umbrella or my backpack gets wet. I love your rain boots. Where did you get them? Very cute! I just got a green one of those bubble umbrellas at Target the other day too! Not that it rains much in AZ, but I had one of those when I was a kid and I hated it, mainly because it was different. I was a kid, what did I know. Wish I still had it, because enveloping myself in a bubble sounds appealing, but don't think it would be big enough for me now. I was a kid, what did I know. I find this umbrella rather cute. The bubble concept is useful during the rain as your visibility works amidst the dome cover. Haha, bubble umbrella! I never had one, what I only got were customized umbrellas but not plastic (I mean see through). Isn't it nice to use it with your boots on? I think the reason why I feel sad with rain is because I didn't have bubble umbrella when I was young. Say, do I also use some of my artistic side to make a statement on my stuffs. I thing the ornamented purple boots looks cute and fabulous though, I think the umbrella lacks design. I'll probably should come up with something for my organizer as well to match it up with my outfits. So much for taking the umbrella a stretch too far, huh? Anyway, it does seem like a good alternative to the older umbrella models around. I wonder if the local stores have it in stock already?